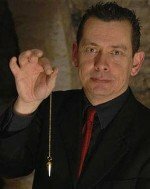 Paul Voodini is a full time working mentalist from England, specialising in the areas of séance, tarot card reading and the paranormal. He works almost exclusively amongst "shut eye" circles, and the information he gleams for this environment he condenses into his books to pass on to the mentalist community. Paul was originally very much a shut eye himself, and learned to read the tarot cards and host séances way back in the 1980’s. Paul’s books offer practical, down to earth advice, and all the routines and performance techniques covered in his work is derived directly from the real world. Most nights of the week find Paul hosting séances or reading tarot cards in stately homes, haunted houses, and derelict castles throughout the UK. The knowledge and experience gained from working in these areas is distilled into his books, making Paul’s books hugely valuable tools for the mentalist, the psychic, and the bizarre performer. Paul is a member of Psycrets, the British Society of Mystery Entertainers. One day he hopes to invent a time machine that will enable him to travel back in time and marry the Fox Sisters (both of them). In this brand new manuscript, Paul recounts some of his greatest triumphs and most terrible failures as a performer! It is perhaps a little known fact that Paul started out as a children's entertainer, before moving into the realms of mentalism, tarot and palm reading, and seance and paranormal evenings. Here Paul relates tales from all areas that he has worked in. These are stories that will amuse and fascinate you, but they also act as lessons and learning opportunities too.